Core Skills || Learning Skills || Combat Skills || How Build From a BPO! || How Improve a BPO! 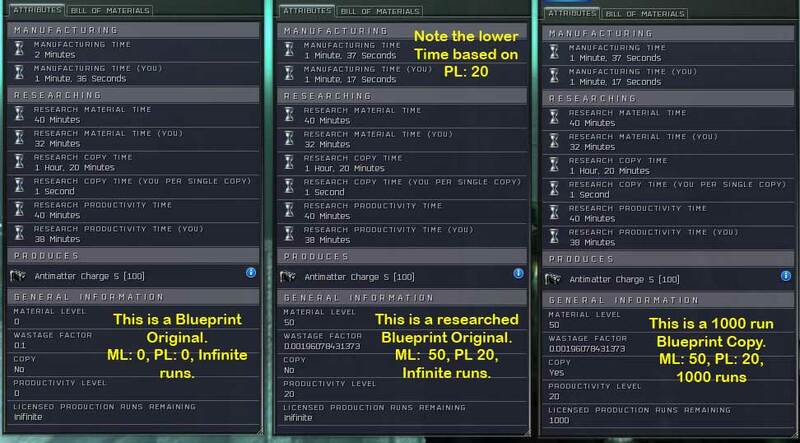 There are three forms of "research" you can perform on a Blueprint Original (BPO). You can copy a BPO to create a Blueprint Copy (BPC) with a certain number of Licensed Runs. BPOs are only able to be sold on the Market system. A BPC can be sold via the Contracts system or used to let friends and corpmates build items you have a BPO for without having to give away the actual BPO. You can improve a BPO in two ways. You can raise the Materiel Level of a blueprint to reduce it's waste amount and make it use less minerals to build. You can raise the Productivity Level of a blueprint to reduce the amount of time it takes to build from the blueprint. Materiel Level is often referred to as Materiel Efficency or ME and Productivity Level is often referred to as Productivity Efficency or PE (not to be confused with the Industry skill of the same initials Production Efficency, that skill actually reduces the minerals required based on the "ME" of a blueprint). To improve or copy a BPO you will need the Science skill. 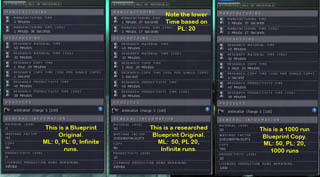 Other skills will increase the speed at which you can improve or copy blueprints, for instance the Science skill gives a 5% bonus to copying speed of a blueprint per level. Metallurgy skill improves materiel efficency research speed 5% per level and the Research skill improves production time efficency research speed 5% per level. The Laboratory Operation skill will allow you to use an extra Research installation line per level of skill for improving multiple BPOs at once. What's the difference between a BPO and BPC? In Fig 1 & 2 you can see the Attributes and Bill of Materiels page for our example blueprint, Antimatter Charge S Blueprint. You can access this by right clicking on blueprint and using Show Info. The first figure shows three blueprints. The left most blueprint in Fig 1 is the original BPO as bought from the market. It hasn't been improved at all as you can see by the Materiel Level of 0, Wastage Factor of 0.1 and Productivity Level of 0 and a default Manufacturing Time of 2 minutes. Also note the "Copy No" and the Infinate Licensed Production Runs Remaining. You'll also note that my skills have reduced the Researching times in the middle down from their defaults. The second blueprint in Fig 1 is an improved BPO. I've researched 50 Materiel Level runs and 20 Productivity Level runs. Note that the "PL" 20 has dropped the Manufacturing time down from 2 minutes per run to 1 minute, 37 seconds. Also note that the ML 50 has dropped the Wastage from 0.1 down to 0.002. In Fig 2 we'll see exactly how many minerals that saved us. The third blueprint in Fig 1 is a 1000 Run copy BPC made from the improved BPO. Notice that it has the same values except it's marked as a Copy (Copy = YES) and has only 1000 Licensed Runs. A BPO viewed from the market will not show the line for Licensed Runs at all. In Fig 2 we see the minerals required for both the orginial BPO and the improved BPO (remember the BPC is a copy of the improved BPO, so has the same stats). With a Material Level of 0 and a Wastage Factor of 0.1 we require 1 Nocxium, 17 Pyerite and 202 (212 with my Production Efficency skill level IV) Tritanium to build. You'd need more minerals with lower level PE skill. The improved BPO however only requires 1 Nocxium, 15 (16 w/PE IV) Pyerite and 184 (194 w/PE IV) Tritanium. So 50 runs of ML research saved us 2 Pyerite and 18 Tritanium! Doesn't sound like a lot, but when it's a ship BPO it can save you millions of ISK worth of minerals. Fig 1 (click to enlarge). Fig 2 (click to enlarge). Materiel Research - Saving Materiels! To begin researching our Antimatter Charges we'll right click on the blueprint and choose Materiel Research as seen in Fig 3. From the Science & Industry - Materiel Research page, Fig 4, we have six things to do. For Step 1 left click on the PICK INSTALLATION button to open the Pick Installation box. In Step 2 you'll left click on the installation listed for your current station. Eventually with skills you can remotely kick off these jobs, but for now we'll stick to current station. Remember, not all stations will have a Materiel Research assembly line in them. You should now see the available assembly lines in the bottom part of the window. 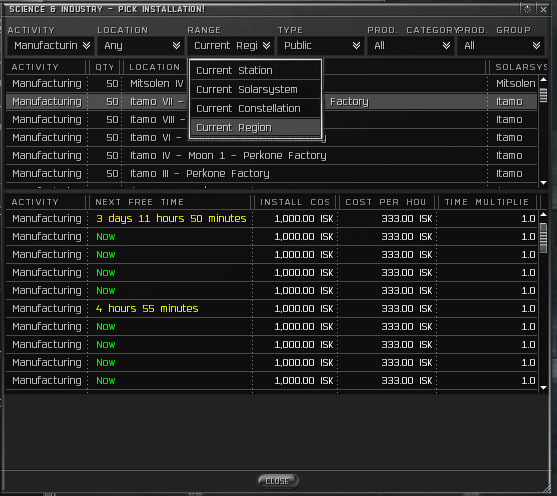 For Step 3 left click on one of the lines listed in the bottom screen to choose that assembly line. Almost all the assembly lines will be occupied so you can choose any of them and it will que up to reseach your item after the listed time. In Step 4 left click on USE ASSEMBLYLINE button to select the line. You'll get the Line In Use popup box telling you the current queue time for that line. After the listed time your job will begin. After clicking YES from the Line In Use button for Step 5 you'll be back to the main Materiel Research screen and for Step 6 can type in how many runs you want to use. For most things a Materiel Level of 15-20 or so is good, so you'd put in that many "runs". The more runs you pick the longer and more expensive the research job will be. Click OK to go to the Accept Quote screen to confirm our choices. In Fig 5 you can see the Accept Quote page. Here we can review the times and costs of our Materiel Research job. You can see that it will start in 22 days, 14 hours and 59 minutes. The job itself will run for 13 hours and 20 minutes. The total cost will be 45,660.67 ISK. 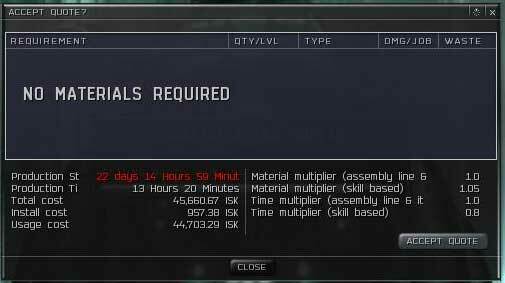 The install cost of 1000 ISK was dropped to 957.38 ISK due to my standings, and the 3502 ISK per hour rate seen on the installation screen was also given a discount, coming in at 44,703.29 ISK. To accept this quote and start the job click ACCEPT QUOTE or click close to cancel the job.